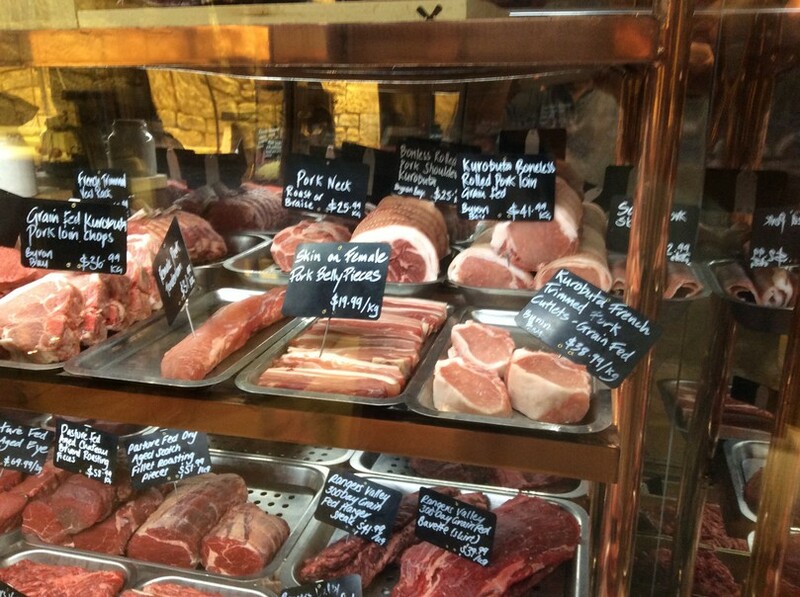 While in Sydney last week, I took the opportunity to visit the Victor Churchill butchery. It is the top end butchery to beat all top end butcheries in the classy eastern suburb of Woollahra! A superbly architecturally designed shop with lots of marble, glass and timber panelling. Glass cabinets showcase the superb (and expensive) cuts of meat on offer, and butchers work on 3 different blocks behind floor to ceiling glass walls. 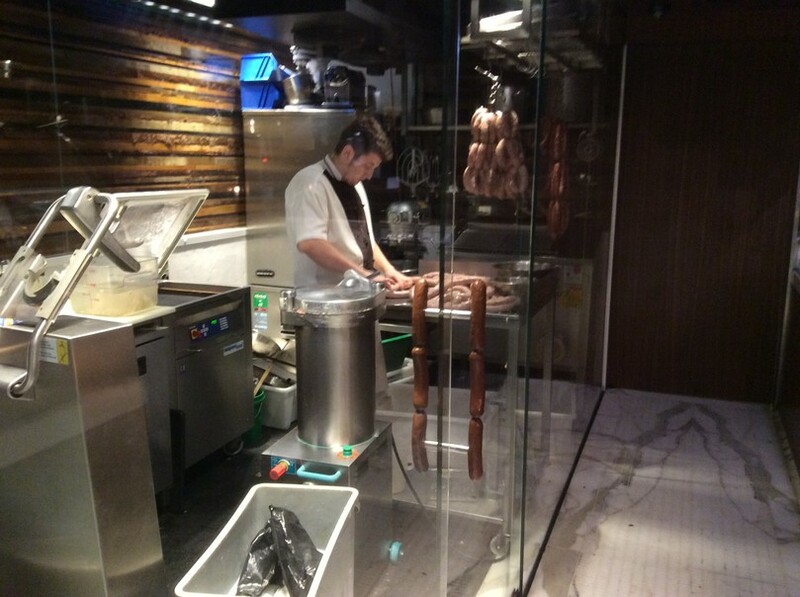 The cool room, storing carcasses and hanging sausages, is also fronted by glass walls. The lamb and pork were beautifully presented, showing great meat colour and sharp butchering skills. However, for me the beef display stole the show. There was a full range of primals from pasture fed, grain fed Angus and Wagyu bodies. Upon selecting the required cut and thickness, the meat is taken from the cabinet to the butcher’s block where it is cut and wrapped in signature paper and packed in a labelled shopping bag not out of place in a Parisian fashion house. The long fed full blood Wagyu beef from Blackmore Wagyu of Alexandra, Victoria, was priced up to $200/kg for the heavily marbled sirloin and scotch fillet. I selected a nice piece of heavily marbled rump – the 500g steak costing $40. All these cuts displayed the highest marbling score possible in the Ausmeat grading system, with fat as white as I have seen. Instructions were to let the meat come to room temperature prior to cooking (as usual), but if left too long before cooking the intramuscular fat would melt and be lost. Cook the meat for 2-3 mins on one side, then half that time on the other side; rest the meat for a couple of minutes……then eat! It was beautifully tender – absolutely melted in the mouth. Normally I barbeque our steaks on the grill turning just once or twice, but this marbled beef was cooked on the hot plate, thinking we ran less risk of losing all the delicious flavours of the marbling – not sure of this is right, but I forgot to ask at the shop! They also sold a large range of smallgoods, sausages made on the premises behind a glass wall as well as several terrines and rillettes. I was in meat heaven! So would I shop there if I lived in Sydney? If I was buying for just Jen and myself quite possibly, but a family BBQ with our two twenty something sons would quickly erode the family bank account. Anyway, if you are into meat, and done the Sydney Harbour ferry/bridge/Opera House experience I’d highly recommend a visit.